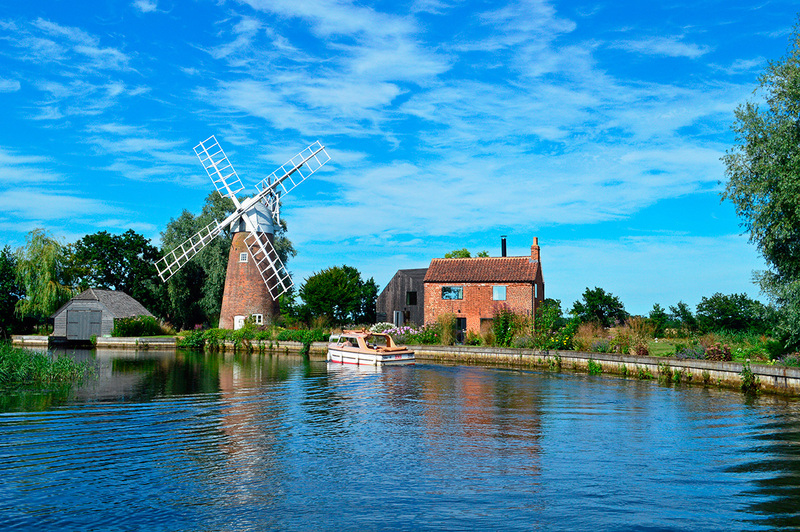 Apart from the Solent, no cruising area is so exquisitely English as the Norfolk and Suffolk Broads. This enticing network of rivers and lakes meanders through low East Anglian country past picturesque villages, lush farms, old windmills, boatyards, church spires and miles of whispering reeds and marshy fen. Wildlife abounds and you see the darting blue flashes of kingfishers. There have been hire boats on the Broads since the late 19th century, but the heydays started in the 1950s. Wroxham is the largest hiring centre, with fleets of all sizes and styles of boats. But for my classic Broads charter I have chosen a traditional class of wooden motor cruiser, the 43ft Silver Jubilee. Now powered by smooth 43hp 4-cyclinder Nanni diesels, these elegant craft were built by Martham Boats in the early 1970s, their hulls planked with mahogany on English oak frames, their cabin sides gleaming with varnish. 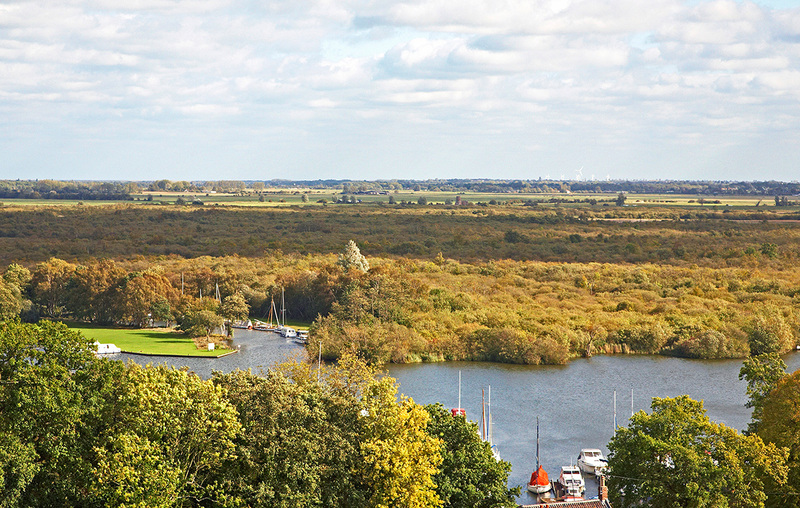 Martham Boats is based on the River Thurne opposite Hickling Broad, a few miles from the North Sea. These north-east fringes of the Broads feel nicely secluded because only quite low boats can pass under the notoriously meagre arch of Potter Heigham bridge. 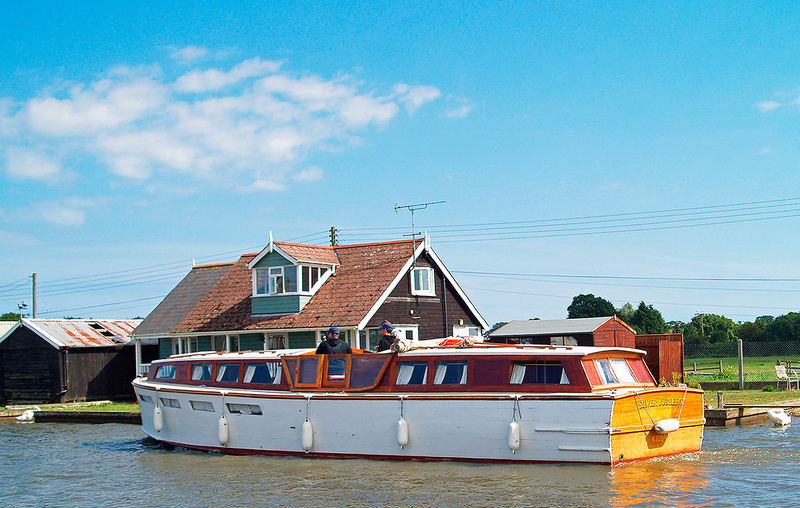 But Silver Jubilee (pictured above) squeezes through safely and lets you explore all 120 navigable miles of the Broads. Moored of an evening at some remote staithe, you feel part of a more gracious era as warm lamplight glows on rich woodwork in the cosy saloon and sleeping cabins. Cruising down the Thurne, turn west up the River Bure to Horning and Wroxham, famous Broads names. Horning has moorings near the black-and-white timbered Swan Inn, where the paddle steamer Southern Comfort often lies alongside. Above Horning you can ‘mud-weight’ in peaceful Salhouse Broad. This unique Broads anchoring technique uses a heavy iron weight, which sinks into the soft bottom. A few bends above Salhouse Broad you reach Wroxham, ‘capital’ of the Broads. Wroxham is a kind of floating village where the river splits into a maze of inlets, backwaters and doglegs around neat waterside houses, chalets and old-fashioned bungalows with boats at the bottom of their gardens. The lower Bure leads down to Yarmouth, where you can follow Breydon Water into the southern Broads and cruise through open country with big East Coast skies. The beautiful River Yare leads up to Norwich past Broom’s boatyard at Brundall, while the Waveney snakes south towards Oulton Broad and then west to Beccles – a soothing old market town whose soaring bell tower gives superb views across Suffolk’s far-reaching landscapes. Guide prices: Silver Jubilee costs from £941 per week low season to £1,281 high season including a tank of fuel (about 114 litres). Getting there: Martham is a 115-mile drive from M11/M25 and 150 miles from M1/M6 junctions, and by rail it is 2hrs from London Liverpool Street to Great Yarmouth, then 25mins taxi.